It’s somewhat intriguing to hear that one of those guys is the dude snapping him the ball. Ryan Jensen gave a heartfelt and passionate answer to a general question about Jameis during an interview on SiriusXM NFL Radio this week. It was great to hear the love in Jensen’s voice. It also was a little odd to hear a teammate talk about Jameis needing to play smarter. Man, September can’t come soon enough. i heard the interview. it was heartfelt…. too bad having NO rt on the roster will be the end of jameis…. no dotson is not a right tackle…. he has never been a right tackle a blocking dummy can produce the same results and actually more points considering the number of penalties. So he is politely saying “The most NFL ready QB in 2015 ” is a slow learner…. He better “heap praise” in get “:in line”!!!!!!!!!!!!!!!!! 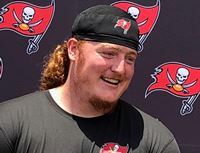 The Bucs just hired a head coach to “fix” jw3!!!!!!!!!!!!! Say what you need to say, keep your head down, Keep your job!!!!!!!!!!!!!!!!!! But we knew the score a year ago!!!!!!!!!!!!! OMG!!!!!!!!!!! Its the famous, always requested “Realist Repost”!!!!!!!!!!!!!!!!!!!!!!!!!!!!!!!!! name anyone else that has had 5 good games in a row!!!!!!! And you are wasting time with this joe!!!!!! Jw3 is going to get the coaches and gm fired after the year, then the new coaches and gm will be told to “fix” jw3 and to sell the fans on a “fresh start”!!!!!!!! The “real” fans want the world famous JBF confidence poll for JW3!!!!!!!!!!!!! Hope it all comes together this year. New coach and a fresh outlook should make a difference. Since drafting him QB hasn’t been this teams main problem when it comes to winning / losing. We can just go through game logs pretty quickly to show this in terms of JW game winning drives and 4th quarter leads vs defensive dominance / the complete lack there of / all the games lost in the last drives by the D. I’ve done it a few times but the same ppl will post the same things. BA was hired to “coach the dirk & smitty outta players” not “fix” winston…..
dirk was hired to get winston to the next level and failed…..smitty was hired to “fix” the defense and failed…..
BA & TB are here to “fix” the TEAM!!!!! !….a TEAM that has lacked development for the pass 3 years…..
Lord Corn this team may not be losing because of JW but, to my untrained eye, he doesn’t seem like he carries us to wins. Lots of his great stats are put up in garbage time. He seems like a guy who will lead you right to the middle of the pack. Hopefully he puts it all together. Hopefully Ryan can talk Licht and Arians to target the right side of the offensive line in the draft so Jamies doesn’t get killed this year. Need a RG and RT…moreso RG, and that will shore up the pass pro side of Jameis, allowing him to make better, not perfect, decisions. Risner or Lindstrom in the top of the second round would help a lot. Land QUINNEN in the first round!! Like what ME 13 had to say yesterday also, about his confidence in the receiving corp going into 2019. I think Gruden is going to make a play for Kyler Murray one way or another, and hopefully, possibly we find a way to go get Quinnen Williams from Bama! Who cares where Carr is traded to, but his contract is very QB trade friendly. LC i agree….How about the line blocking better and setting up the run WITHOUT drawing stupid penalties and a lot of the problems will be fixed. Running for your life and slinging it all day because you can’t establish the run or you are down considerably at the half will have higher chances of mistakes as your pass attempts go up, oh and having our defense actually stop some body marching down the field at will will help too. Tmax you forgot RG too. “he’s learning” ummmmm its been how many years…. ffs dood. Jawaan Taylor will help solve Jameis’s problems on the right side of the line. Hope we draft him. next year. IMO he is one of the top QB’s in the league. Jameis is very lucky to be have the contract he has. Its time to put it all together Hoping he is more consistent this year and avoids some of the mistakes that can be the difference between wins and losses. Does anybody really think that Jensen is going to come out and say anything negative about Jason Licht’s Chosen One? I’m sure that he would say the same nice things about Fitz, Flacco, etc. The day we fire Jason Gump is the day the Bucs get better!!!!!!! The “garbage stats” is the biggest false narrative on Winston that a lot of people here throw out there. If this was true most of his stats would be in 2nd halves; but he actually lead more scoring with our offense in 1st halves last year comparatively, and when charted over his career it’s basically very even. In terms of not carrying us to wins – just go look at the game logs of any close game. Go look how many times he took the lead in the 4th quarter only to lose. It’s pretty damn ridiculous. In 2017 alone – he was robbed of 4 game winning drives by defense/special teams – in situations where he took the lead late and then never got a chance again and we lost. Hell think of how bad our kickers have been for any close game lol. ALSO – every year he’s been here – on average we get blown the f*ck out 1 in 4 games. Those same games he typically will throw 2-3 INTs and those same games typically make up 1/2 or more of all his INTs in a season. Think Minnesota game 2017 when we’re down 21 early in 2nd quarter because the D gets shredded by Case Keenum of all people. Winston had to press and that was one of his big turnover games of the season. That’s not just a Winston thing. Look at Fitzpatrick vs the Steelers Monday night. Got in a big hole early 2nd quarter – turnovers start coming as he presses. THat happens to most QBs in these types of games. BA doesn’t need to fix Winston. He needs to fix the entire offense in terms of scoring in the red zone. I charted that as well – Dirk Koetter for basically 7 of 8 years led offenses where the yardage was WAY better than the scoring. I.e. ranked top 8 in yardage gained in the season but ranked 19th in scoring. That’s a dirk koetter thing that BA hopefully fixes. Cleveland has had lots of draft stock for years. That hasn’t been a quick project. 3-4 years of drafts + Mayfield and they still didnt’ make the playoffs – so it’s more like a year 4-5 type thing IMO. I agree Ballard is killing it actually. Licht = below average GM that the Glazers think is a great GM because DOminik was a historically bad GM that left them scarred for life. Time for a song from the great Billy Joel that describes JW’s career to this point. If BA can even things out for JW we have our franchise QB. And if we have our franchise QB we WILL win! This emphasis on taking the lead in the fourth quarter really puzzles me. No 1. it hasn’t proved very successful for even the best Qb’s in league. I believe Peyton Manning had more comebacks in his career. This strategy only accounted for an average of two wins a season. Good points. That trend actually extends back to his last year at fsu. So it’s a winston issue not team related. Bob- Dirk Koetter killed our last drives of the half with his conservative playcalling. Also coming out at halftime, he made zero adjustments as did his buddy Smitty on the other side of the ball. Do not forget history just to fit your narrative. This was well documented by the Joes and those that post here throughout the last 3-4 years. Yes Lovie was equally as bad but Dirk was running that show on offense as well. As far as the fourth quarter goes, if Jameis gets us the lead with 2-5 minutes and the defense goes out and gives the lead right back, what else did you want him to do? He had to outright defy his head coach and win a game on the last play because D-Bag wanted to run the ball and play for OT. How many games have our kickers lost when JW gets them in FG range? C’mon guys and girls remember history, don’t just make spit up because you don’t like Winston. Lord Cornelius brings stats and everyone else brings opinions- Kudos LC. Its just not realistic to blame everybody else as some do . Its a team game and everyone’s mistakes add up to losses. Yes Koetter turned into a conservative coach in part because Jameis had too many turnovers. I also have seen two or three games a year where Jameis mistakes gave the opposing team at least a 14 point lead. When we start getting a 14 point lead and build on it through the entire game we will have more easy victories. And if we are behind ,the third quarter is about as late as good teams would wait to mount a comeback. We literally have ha e waited years to see a post from tmaxcon that doesn’t bash McCoy, and the best he can give us is an idiot statement about Dotson??? Dotson has been one of the best RTs in the league, and he gets among the fewest penalties among RTs.